Abilene needed a big hit in this June 1995 game and Pat Dando came through, according to The Pueblo Chieftan. With his team down by four in the eighth inning and the bases loaded, Dando hit a grand slam off Pueblo reliever Brian Nelson. Nelson gave likely the opposite reaction as Dando after the game, telling The Chieftan, "I really feel bad about that." Dando hit that grand slam in his sixth season as a pro, his second in independent ball. He played in one more season. He never made the majors. 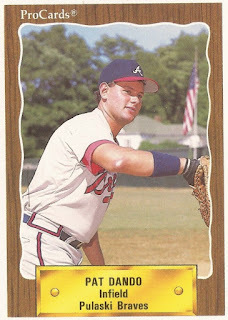 Dando's career began in 1990, signed by the Braves as a free agent out of Panola College in Texas. Dando started with the Braves at rookie Pulaski. He hit a stellar .360 in 69 games. He played for three teams in 1991, single-A Macon, high-A Durham and high-A Miami. His overall average dropped to just .198. For 1992, he moved to the Royals system and high-A Baseball City. He went 4 for 4 in an April game. He hit a home run in an August win. Overall, he hit .281. He then moved to high-A Wilmington for 1993, hitting .237 there. It was his final year in affiliated ball. Dando moved to independent Beaumont for 1994. He hit .292 there in 82 games. He then played 1995 between Abilene and Mobile, hitting .287 on the year. His final pro season came in 1996. He played at independent Greys Harbor and Alexandria. He hit .280, with six home runs in his final season as a pro.